Simple Mehndi designs that entice you to try your hand on! Simple Mehndi designs have always won many hearts with its colour and texture. To celebrate your festivals with great festive mood just pick up a cone and start painting your hands with these simple yet attractive designs. This is simple and elegant hand design that needs just a few minutes and you are all set to move on. It completes your jewellery need. As you see there is a small ring made from circle and dots right at the place of a ring. A combination of rectangular and square at the wrist will give an impression of wearing a bracelet. Amazing, isn’t it? A perfect selection for small functions like ring ceremony or festivals. 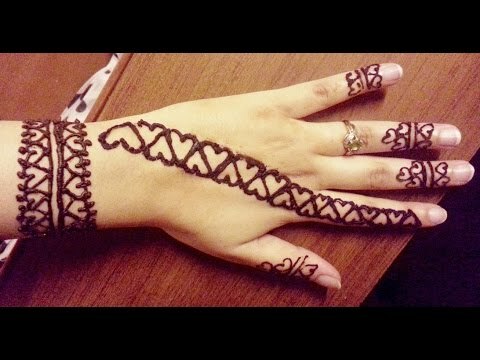 This simple henna pattern are for beginners. Start with a circle that you learned at your school. With repeated circles and flower petal you create simple Mehndi designs that make you an expert very soon. Keep trying till you become a designer. The design is simple and sober. Completing your all make-up needs. This is an easy design that is worked with lines and dots. It adds volume to your hand. Complete your look with a nail art and show your creativity by adding stones at different places. A simple and easy design for beginners. Flowers are very common in Mehndi design. Pick your Mehndi cone and start making the flower and draw lines to make leaves. The design is just apt for you as a keen learner you will startle everyone with your this creative hands design. Isn’t it looks like a jewellery? This is a simple design but looks attractive and very easy to make. Start with a flower and fill it with lines and dots. Make a string with a dot as shown in the figure. Believe me, no one will believe that you made this design. Add nail art to toenails and become a head turner. The design looks very heavy but easy to draw. This is a fine work of the circle and half peacock design. To make it look heavier, add dots at different places and flaunt your style. The design is suitable for festivals and small get to gathers. If its ring ceremony, then this is the design for you. The design seems heavy but it’s just work of thin and thick lines. 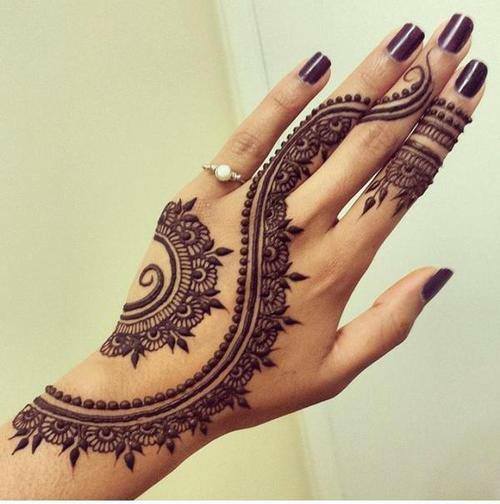 With this variation, you create this wonderful Henna design. This simple design will make your ceremony special and enjoyable. Then what are you thinking of, just pick your cone and start with it? This Henna design is simple and easy. It is made with the help of circles, lines and dots. You start with a big dot in the centre and then make a circle around it. Curves around the circle and then another circle. Add dots in places to make it look rich and attractive. The simple design is suitable for any small function. Do it anytime as it won’t take more than 15 minutes. For complete looks make dots on fingers and make loops with the cone to give it a heavier and complete look. 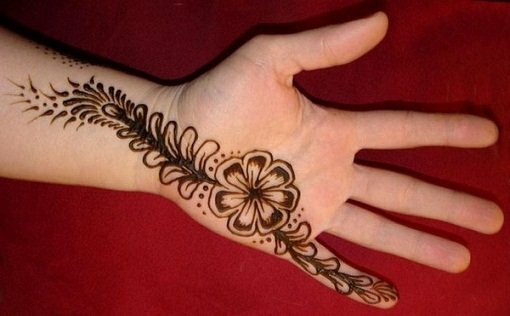 Paisley design- Here comes another wonderful Henna design that no one will believe that you made it. The hand’s design is started with a paisley and then given a peacock look by adding beak and eye to it one of the sides. Make simple feathers with semi-circle along one of its sides. Lines and square pattern make it an easy task and filling small squares with Mehndi completes its look. The design is just perfect for Navratries and ring ceremonies. They look beautiful and easy. I have a cone that is lying around in the kitchen and have been waiting to put Mehendi owing to the time it takes. But never thought of putting something simpler that is less time consuming.